Today’s cable news carried the headlines about Virginia Democratic Governor Ralph Northam. Northam is the 73rd Governor of Virginia, being elected in January 2018. He attended Eastern Virginia Medical School. He is a physician by occupation having served as an United States Army medical officer from 1984 to 1992. Northam completed pediatric residency at Brooke Army Medical Center in San Antonio, Texas, and did a child neurology fellowship at Walter Reed Army Medical Center in Washington, D. C. and John Hopkins Hospital. Since 1992, Northam had been a pediatric neurologist at Children’s Hospital of the King’s Daughters in Norfolk, VA.
On February 1, 2019, a photo from Northam’s medical school yearbook’s page was released. It shows an image of a person alleged to be Northham in blackface standing next to a person dressed in the hood and robe of the Ku Klux Klan. A spokesman for Eastern Virginia Medical School confirmed that the image appeared in its 1984 yearbook. Conceal carry laws have replaced ropes. 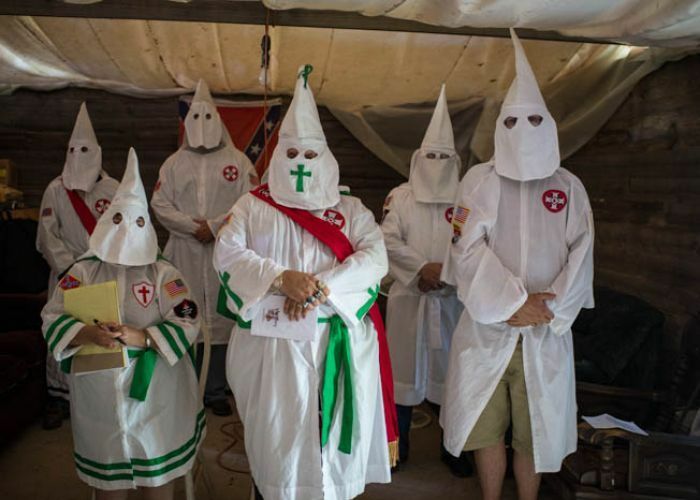 In response to a string of recent break-ins, the Traditionalist American Knights of the Ku Klux Klan has given a local Pennsylvania chapter the go-ahead to form a neighborhood watch group. “You can sleep tonight knowing the Klan is awake!” read fliers promoting the neighborhood watch group in Fairview Township. The leaflets appeared on the doorsteps of homes along Ridge Road on April 18, PennLive reports. The KKK’s neighborhood watch flier for Fairview Township. 3 Dead After Suburban Kansas City Shooting. An update: It is now being considered a hate crime. Illinois’ New Conceal Carry Law-What Now? Illinois is the last state to legislate conceal carry. Appropriately interpreted by the Second Amendment of the U.S. Constitution, I call it the Citizens’ Militia gun rights act. Illinois Governor Pat Quinn vetoed legislation for conceal carry in Illinois, blasting them for negotiating away public safety to appease the National Rifle Association. (NRA). In December 2013, a federal appeals court ruled the state’s ban on carrying concealed firearms was unconstitutional. Governor Quinn put up a good fight to prevent conceal carry from becoming Illinois law. In the end, the NRA won. Some good did come out of it. The legislation allows for business owners to ban firearms on their property as long as they post signs indicating they don’t allow guns. I saw such a sign yesterday posted on a bank.